Hey friends, James Jnr here from the Coaching Room. In this article you will learn how to engage, build and maintain incredible relationships with 15 easy to read tips. Each tip is one that I have tried and swear by personally. When you read this E-Book and apply what you learn here, my hope is that you too will enjoy the relationship success I have enjoyed thanks to my NLP Training. Yet many people spend their time comparing and judging themselves against someone else. Trying to be someone else, or live their life to someone else. Comparing yourself in any way to any other is like looking for one of these sixty-four billion fingerprints just so you can go "we're the same". It’s a crazy proposition. Pacing is all about matching the other person, which is, entering into the person’s world to be there with him or her, which means to literally take on the movements, neurology, words, understandings, etc. of the other person and match them with our own. Because we are typically not aware of these facets of our ongoing experience, they lie outside of our conscious awareness, pacing communicates unconsciously. It says, "I know your world, I can sense and feel and think in terms of your world of experience." You are inviting stress into your life because you are trying to control things that are outside your power. Worse, as you become overly responsible, you encourage others to be under-responsible “if it’s your job to make me feel good, then it’s your fault when I choose to feel bad”. 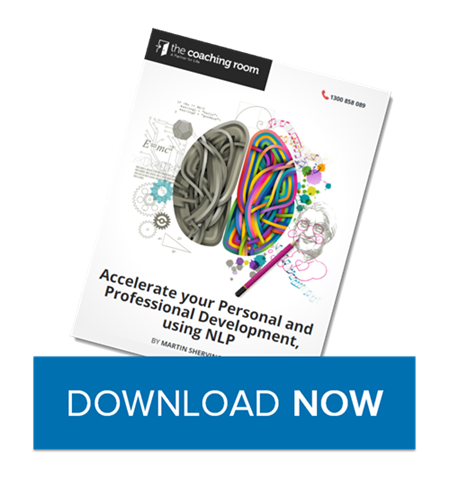 This NLP tip is to be responsible for you. You may be responsible to others externally e.g. duty of care, societal laws etc., but you aren’t intrinsically responsible for what they decide to think, feel, do, or say. Phew what a relief, that’s a lot of work you can save yourself from having to worry about. Chances are you have gone from thinking “what a jerk” to “oh my I hope he gets there in time”. This is a simple example (and by the way a true story) of how easy it is to assume negative intentions for behaviours we don’t like receiving. And the problem with that, just like in the example, is we don’t treat people based on what their true intentions actually are (which are often never as bad as we think they are), we treat them based on what we mind-read them to be. * You forgot to do the dishes because you don’t care about me. * You’re using that tone of voice because you blame me. * You didn’t invite me to that gathering because I am obviously not important to you. * You raised your voice because you are trying to bully me.